Do YOU want to take steps to #SaveOurOcean? At The Ocean Conference, held in June 2017 at UN headquarters in New York to further implementation of Sustainable Development Goal 14 aimed at conserving and sustainably use the oceans, seas and marine resources, close to 1,400 voluntary commitments for concrete ocean action were made by governments, the United Nations system, civil society organizations, academia, the scientific community, and the private sector. These commitments, together with the Conference outcome document Our Ocean, Our Future: Call for Action, mark a global breakthrough on the path for the health of our oceans and seas. To follow-up on the implementation of those voluntary commitments, the United Nations Department of Economic and Social Affairs (UN DESA) and the UN Secretary-Generalâ€™s Special Envoy for the Ocean, Ambassador Peter Thomson, have launched nine thematic multi-stakeholder Communities of Ocean Action to spur further Ocean Action, and to maintain momentum until the next Ocean Conference, anticipated to be held in 2020. Supporting the work of the Communities, UN DESA has revamped The Ocean Conference Registry of Voluntary Commitment, available at oceanconference.un.org, which now provides a platform for all stakeholders to report on their commitments, and for sharing of knowledge and best practices within and across the nine Communities of Ocean Action. Each Community will organize on a regular basis virtual global webinars and face-to-face expert meetings. Join the Communities and the Ocean Action Newsletter to ensure you receive information and invites. All stakeholders with a registered Voluntary Commitment are welcome to regularly share progress of their commitment(s). 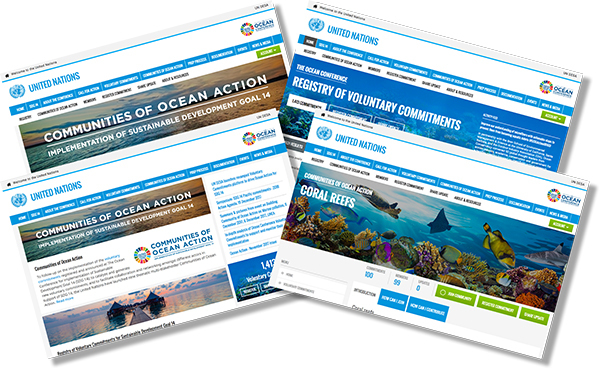 Updates will be featured on the relevant Community of Ocean Action pages and in the Ocean Action monthly newsletter. All members of the Community Ocean Action can share their expertise, knowledge, best practices and ask/respond to questions in the Knowledge Forum, available under each Community of Ocean Action pages after logging in. Once created, Contact us (see link below) and let us know so we can link your Voluntary Commitment(s) to your account.